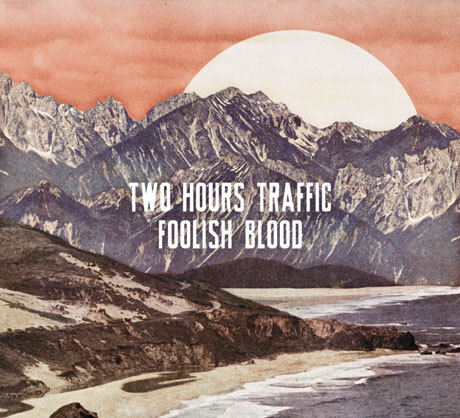 Charlottetown, PEI indie ensemble Two Hours Traffic premiered their new lineup earlier this year on their Siren Spell EP, and the slightly altered outfit will show us what they can do for an encore via the release of their next full-length, Foolish Blood. The album drops February 19 through Bumstead, and press materials assert that the 11-song set is full of "upbeat pop bangers." Previously released Siren Spell tunes "Audrey" and "Amour Than Amis" figure on the LP, which was captured in a two-week session with producer Darryl Neudorf (the New Pornographers, Neko Case, the Sadies) at his Operation Northwoods studio in rural Ontario. On top of the work from the quartet proper, guests that stop by on Foolish Blood include Arkells keyboardist Dan Griffin and pedal steel player Dale Murray. You can get a new taste of the set via a stream of anthemic album track "Last Star," which you'll find beneath the tracklist below. You can also see the newly revealed album art above. In addition to the LP news, the band have announced they'll be hitting the road sometime in 2013, though specifics on their impending show schedule have yet to be revealed.